This review will read much like the Lifestream review that I wrote a few weeks ago. It is from the same developer and follows the same format of game play. 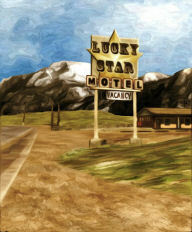 Shady Brook is another of those old interactive fiction games popular in the early days of home computers, brought up to date in an Adventure game presentation. As with Lifestream, there are no action scenes or fast reaction fight scenes to contend with, and no voice acting. The graphics are very good, as are the background sounds and music. The game is a hybrid, a blending of the old text-only adventure games and a modern point and click interface with good graphics. When you can play a text adventure without typing, that is always a bonus. 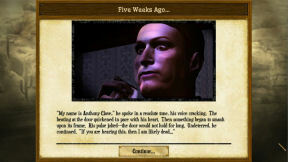 The length of the game will vary based on the player. It should average about eight plus hours. Due to its origins, consider it like reading a book and as a player you determine the direction or path you take. It is the text equivalent of a full-length novel! It is a text adventure with point and click mechanics. You have a musical soundtrack as a background and sound effects which are good. You have a choice of two difficulty levels: easy and medium. I did not compare one version against the other. Having played the medium level, I did not encounter any difficulties or “hard” gaming. See the screen shots to view the quality of the graphics, which I found quite good in still picture format. Saves are of the automatic variety. You cannot create saves; this feature has always been off-putting for me, however the automated saves are well done in this application. When you reopen the game, a play button takes you back to where you left off. For me it worked without a glitch. The downside is you cannot go back to a previous save to replay a scene. This is a text adventure game with a unique interface that is pleasant to navigate. If you have played Lifestream or read my review, you have seen this before. Your navigation is by compass, meaning on the bottom left of your screen is a compass where you click various directions that you can move to. The left side of your screen features a panel with a vertical listing of icons. The first is a stick figure which you click to engage the play screen where you interact with the game. The second is a backpack containing your inventory. The third is your map. 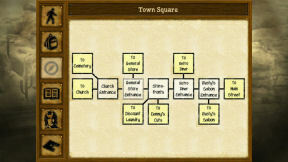 Clicking on the map will bring up a pattern naming the rooms in your locale. The room you are in will be blinking. It helps to orientate you regarding your choices or routes available on the compass. It does not allow you to simply click to go to another location. The fourth icon is your notebook where you store and read items such as letters that you have picked up. The fifth is a character icon showing the character that you are playing and the bottom icon is for accessing options. They are pretty much the same as found in Lifestream. You have the ability to adjust various settings and access the main menu to continue or quit. The game does not provide a walkthrough. In inventory you can combine items, to create another or select one to apply to solve a puzzle. There are puzzles in the form of questions where you select the correct answer or from a list to do things in the right order. You pick items up as you go along as in any adventure game. One of the screen shots shows your basic screen. The title shown in the graphic is labeled “Your Bedroom.” It is not your opening screen of course but it typifies the game screen. It is where you play the game. You are in the bedroom and you have choices of what to do next. ( “Look at the bed” “Investigate the safe” or “Pick up the tape recorder” ) You will note the compass offers only one direction where you can go from here. Click on the compass or look at your map to see where you are. With this type of game the story determines whether it is for you or not. Jake is tasked to discover the town’s terrifying secrets and it is a dark, mature storyline. There is an achievement bonus allowing you to view a special post-game bonus scene if you unlock 33 achievements through game play. No it’s not attached to any tracking website. I found this game to have a well written storyline, though as I went through it there was a sense that I’ve seen this before. And no, I had not played the 2005 adventure game version. It must have been the story itself being too similar to a hundred made for television movies in this genre. I give them points for blending an old interactive fiction text-only format with point and click graphics. However the game is dark, bordering on horror, and the story was too fatalistic for my taste. Whether this is a game to play is up to you. At a budget price you cannot feel cheated after 8 hours or more of game play. I could not find it available online at any of the usual download site so I’ll include a link to where you can find it - at the developer's website.